The culture led tourism trend is likely to grow nationwide. Although the tourism has rejuvenated old towns to get back on track, the lesson learned from many destinations collapsed from hasty development and improper long term plan leads us to find the balance between development as well as preservation. “Chantabun Model” from the thesis to the cultured led tourism along the Chantabun riverside in Chantaburi is the sample of sustainable area preservation. “Chantabun Model” arises from the awareness of cultural and architectural preservation, which was began from the community realisation in preservation and sense of ownership. This 120 year-old Chantabun riverside community was once a significant trading provision of the east and Chantabun river was the main route for goods transportation with multi-cultural establishment, as a result , the architecture here was influenced by the western and the Chinese cultures with Thai identity translated through the materials and the usage purposes. Rattanin Suprutpanich and Praewporn Sukasathian, master degree students from Arsomsilp Institute, selected Chantabun Riverside Community to work on their thesis before it has become the commence of the area preservation and regeneration for the culture led tourism and the birth of “culture rather than commercial approach” vision. From the thesis of their students, the architecture and community preservation team from Arsomsilp Institute comprised of Professor Thip- Thip Srisakulchairak, Toe-Panumas Chayen, Pa-Prapaporn Bumrungthai, Tai-Teewara Pitakpatthanakul, Nang-Kusuma Boonkarn, and Meaw-Pilan Thaisuang have established the company in the form of social enterprise to create the model for area preservation for sustainable tourism. “We have established Chantabun Rak Dee Company Limited from the collaboration of Arsomsilp Institute and the community in the name Chantabun Riverside Development Association to operate the architectural preservation and heritage site regeneration project. We also focusing on the collaboration of the community and provide guidance of preservation which is able to leverage and support the local lifestyle” revealed Professor Thip. The owners of 2 houses have invested with us by offering their homes to cultivate for 30 years with one Bath monthly rental fee. 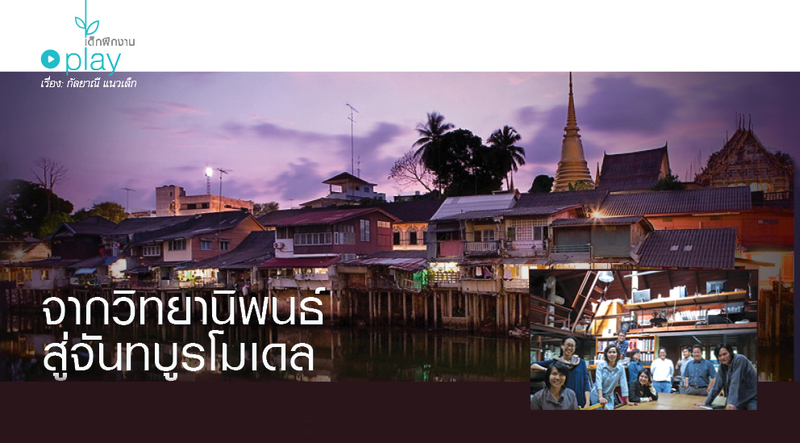 The company started the fundraising scheme to gain some finance from people in the community, Chantaburi, and the public who share the similar ideal to renovate Ban Khun Anusornsombat and Ban Luang Rajamaitri as the learning centre for community and the Museum Inn. Besides, “Nang” and “Meaw” also shared another project operated at the same time. “We created the preservation and regeneration plan for Chantabun Riverside Community and also build up the learning area with the local history, the Chantabun Riverside Community case study. Therefore, the community is able to plan and make the agreement to live together as well as leverage the level of society, culture, and economy grown from their own history base”. “We hope that this project does not only present the form of preservation with collaboration in all aspects but also encourage the locals to build up the sample of preservation and then take it to apply in their home and community. At the same time, this project could possibly pass down the local value from generation to generation as it offers opportunities for new generation to earn income without leaving their home. They will be the vital force to regenerate and preserve the unique culture along with the modern trend and the tourism inclination.” Tai said.